What you eat and how much can have a huge impact on your longterm health. Healthy eating habits are important to prevent a long list of ailments, which is why health officials for decades have encouraged families to eat more nutritious foods like fruits and vegetables and avoid junk or processed foods like chips and fast food cheeseburgers. But for more many families in the United States, it's not that simple. According to the U.S. Department of Agriculture, more than 23 million people in the United States live in areas without access to supermarkets or other stores selling a variety of affordable healthy food options. These communities, known as food deserts, are a serious environmental health issue that can impact the lives of families for generations. While there’s no one standard definition to go by, food deserts are generally considered to be places where residents don’t have access to affordable nutritious foods like fruits, vegetables and whole grains. Instead of grocery stores or farmers markets, these areas often have convenience stores and gas stations with limited shelf space available for healthy options—making nutritious foods virtually inaccessible for many families there. But accessibility can be relative, and proximity to a store is only one factor of many that influences a person's ability to eat healthily. Income and resources (like transportation) can also keep people from being able to access healthy food options. For example, two neighbors might each live a mile from a grocery store, but one has a car while the other relies on public transit. The neighbor who drives regularly will likely have more options when it comes to groceries than his friend next door. Socioeconomic status might also play a role, as low-income individuals get priced out of high-quality health foods. After all, $50 worth of boxed meals and frozen dinners can often last a family longer than $50 worth of fresh vegetables and lean meats. They’re also quicker and easier to prepare—something that matters a lot when parents work multiple jobs or long hours to make ends meet. Because of this, pinning down what precisely constitutes a food desert can be challenging. For its part, the USDA hammered out a few parameters in its investigations to determine whether an area had limited access to healthy food. It classified an urban area as a food desert if it was more than 0.5 or one mile away from a supermarket, grocery store or other sources of healthy, affordable food, and rural communities were those located 10 or 20 miles away. But the department also looked at other factors beyond location, such as low-income status and access to a vehicle. When most public health officials talk about food deserts, they’re often referring to urban environments—inner cities where higher property costs can scare away many potential grocers. But while roughly 82 percent of food deserts are in urban areas, rural communities aren’t exactly exempt. According to the USDA, an estimated 335,000 people in the United States live more than 20 miles from a supermarket. Food deserts exist all over the country, but they are more common in the South and Midwest, with lower income states like Louisiana or Mississippi seeing a disproportionately high percentage of the population lacking access to healthy food, compared to states like Oregon or New Hampshire. Lower income areas, in general, are typically the hardest hit by food deserts. According to a USDA study, moderate and high-income areas had more than 24,000 large grocery stores and supermarkets in 2015, while low-income census tracts had just 19,700. In fact, half of all low-income zip codes (that is, where the median income is under $25,000) qualify as food deserts. Low-income individuals—especially those without access to a car or who live in remote rural areas—often have the hardest time getting healthy foods. For these individuals, obtaining healthy food means driving further to get them. That is, of course, if driving is even an option. More than two million households located in food deserts don't have a vehicle, according to the USDA. 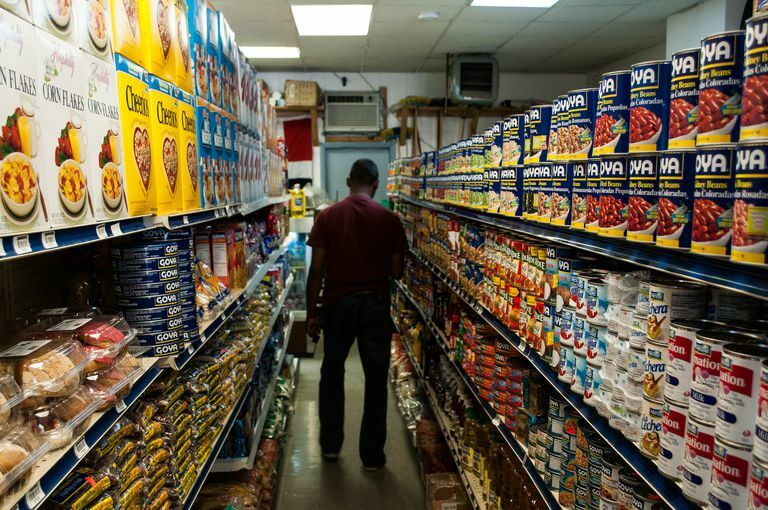 Residents of urban food deserts also pay more for groceries than families in the suburbs. By one estimate, they pay up to 37 percent more for the same exact products, typically because of higher operating and shipping costs inside the city. Lower-income families already put a larger percentage of their paychecks toward buying groceries, but living in a food desert means that paycheck won't stretch nearly as far as it would have in areas where fresh fruits, vegetables, and proteins are more accessible. When faced with those obstacles, it's no surprise that some families opt for the less-healthy—but much more affordable—options available to them. It should be noted that living in a food desert isn't the same as being food insecure. Not everyone who lives in a food desert lacks access to healthy foods. Making the trip to a big store or having groceries delivered is typically still an option for those who have the means and opportunity to do so. Likewise, a person doesn't have to reside in a food desert to lack access to things like whole grains and fresh produce. In some cases, such foods might be available, but high prices make them unaffordable to some. Food insecurity is a very real issue that, while more common in food deserts, isn't limited to them. The biggest health concern linked to food deserts is, ironically, obesity. And that makes sense, given that people who can’t easily access healthy foods tend to eat less healthily than people who can. Unhealthy eating habits lead to weight gain, and that, in turn, leads to obesity. Being significantly overweight or obese increases a person’s risk for all kinds of health issues, including diabetes, heart disease, stroke and high blood pressure. Being obese during pregnancy can also up your chances of complications like gestational diabetes, preeclampsia, birth defects and miscarriage. Excessive weight may even increase your risk of cancer, with one study estimating a jaw-dropping 481,000 new cases of cancer worldwide in 2012 were due to being overweight or obese. The impact has the potential to last for generations, too, as kids of obese parents are more likely to become obese themselves. Beyond just obesity, unhealthy eating habits in the first few years life can also significantly affect a child's ability to grow. Brains and bodies develop quickly during early childhood, and to do that, they need key ingredients. Not getting enough foods rich in things like iron, vitamin A or iodine has been linked to cognitive difficulties, weaker immune systems, and stunted growth. It's not just child nutrition that matters either. Babies born to women who don't get enough folate in the early stages of pregnancy have a higher risk of being born with potentially serious birth defects. Decades of nutrition research have found that unhealthy eating habits can have severe—and sometimes lifelong—consequences, which is why health officials are concerned about so many people living in areas with poor access to healthy foods. Another oft-overlooked concern about food deserts is the risk posed to those with dietary restrictions and food allergies. An estimated 15 million people in the United States have a food allergy (some more than one), many of which can be life-threatening. Roughly 200,000 people a year have to receive emergency medical treatment because they ate or drank something they were allergic to. Not being able to buy food that they know is safe can force people to take unnecessary risks in order to feed themselves and their families. That said, while studies have found significant links between a community's lack of supermarkets to health issues like obesity, recent research is also beginning to signal that that relationship might be a whole lot more complicated than was previously believed. Low income and education have both been linked to obesity outside of the context of food deserts, and some recent studies have concluded that socioeconomic status might play a more important role in nutritional outcomes than proximity to a grocery store. But making affordable healthy food easier to access is only part of the solution. By one estimate, providing low-income neighborhoods with access to higher quality food would only drop nutritional inequality by nine percent. That’s because while opening up supermarkets in former food deserts might bring healthier food options to the neighborhood, it doesn’t magically change food-buying habits. Neither does families moving to a place where healthy eating is the norm and health foods are abundant. Families get into a groove of what they like to eat and how much they like to spend on groceries. As many parents can attest, it takes a while to find a menu of things the whole family can enjoy, and disrupting that routine will take a whole lot more than building a store nearby. Helping communities gain closer access to more affordable healthy food options is an important step, but it should be accompanied by efforts to change eating behaviors, too, through expanded nutrition education. Food is a deeply cultural and personal thing. Many families have beloved meals that give them comfort and make them feel at home, and religions often incorporate food into their celebrations and rituals. In order to bring about any meaningful change, nutrition education should be created with these traditions in mind, being careful to acknowledge deeply rooted cultural norms found in every community. Any efforts to combat the issue of food deserts and nutrition deficits should also be practical for the community they're targeting. Encouraging families to participate in a community garden, for example, might not be feasible in an area where many of the adults work multiple jobs with minimal free time to pitch in. In light of what we know about food deserts, some researchers investigating nutritional gaps are shifting focus away from a lack of healthy food options and instead zeroing in on an abundance of unhealthy ones. These areas—dubbed "food swamps"—don't just lack grocery stores; they are also crammed full of fast food places and convenience stores. Studies have shown that the presence of these areas is linked to a poorer diet and is possibly an even stronger predictor of obesity rates than a lack of supermarkets, as the in-your-face presence of unhealthy meal options virtually cancels out any benefits adding grocery stores might bring. This has encouraged many health agencies to take a different approach to food deserts and swamps by adapting the existing environment to make healthy choices easier to make. Instead of trying to attract grocery stores, some cities have tried to go where people already do their grocery shopping and urge corner stores and gas stations to spend more shelf space on affordable, fresh produce. Others have set up mobile farmers markets that resemble food trucks to drive out to low-access areas so that residents don't have to go out of their way to buy healthy food. The key to addressing both food deserts and food swamps is to acknowledge that every community is different and, therefore, will likely need a unique combination of strategies. Opening up a grocery store in every neighborhood can sound good in theory but might be impractical or unnecessary in practice. Helping families find healthy, affordable and practical meals will likely require some innovative solutions, but it is essential to maintaining and improving the health of communities for generations to come. Alcott H, Diamon R, Dubé, J. The Geography of Poverty and Nutrition: Food deserts and food choices across the United States. National Bureau of Economic Research. 2018. Centers for Disease Control and Prevention. Gateway to Health Communications & Social Marketing: Food desert. Rhone A, Ploeg MV, Dicken C, Williams R & Breneman V. Low-Income and Low-Supermarket-Access Census Tracts, 2010-2015. United States Department of Agriculture. 2017. Ver Ploeg M. Access to Affordable, Nutritious Food is Limited in "Food Deserts." United States Department of Agriculture. 2010. Ver Ploeg M, Breneman V, Farrigan T, et al. Access to Affordable and Nutritious Food — Measuring and Understanding Food Deserts and Their Consequences: Report to Congress. 2009.